Available for purchase online at Penguin Random House, Walmart, Target, Barnes & Noble, Amazon and Indie Bound. Yo, ho, ho! It's bedtime! But this little swashbuckler will do anything to avoid going to sleep. Read along as he stalls for time - searching for peg-legged Captain Teddy, stowing his toys in the ship's treasure chest, and even playing a game of walk-the-plank! Snuggle up with your own little pirate for a fun and delightful high-seas adventure as you wind down your exciting day together. 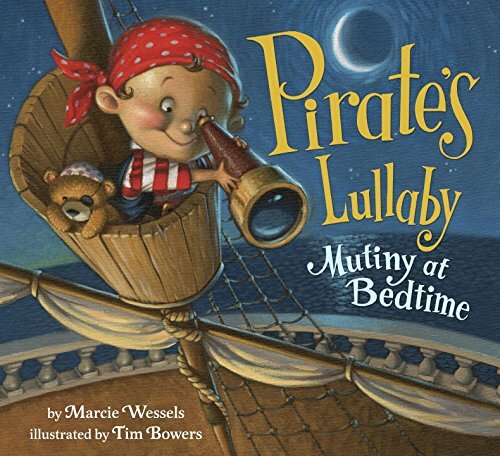 Pirate's Lullaby: Mutiny at Bedtime was chosen by the San Diego Symphony for its Symphony Story Time. Here is the video from Symphony Story Time at the 4S Ranch Library in San Diego, CA. Tricia Skye (horn), Susan Wulff (bass) and Marcie Wessels (author) read Pirate's Lullaby: Mutiny at Bedtime at Symphony Story Time at the 4S Ranch Library on 7/1/16. Do you know how to say "pirate" in ASL (American Sign Language)? Check out this video from my Children's ASL Story Time at the San Diego County Fair. Many thanks to Isaiah and Brandon for interpreting.